Texas: 32 electoral votes, another of the so-called big enchiladas or if not an enchilada at least a huge taco. Only votes talk, everything else walks. The dream begins with a teacher who believes in you, who tugs and pushes and leads you to the next plateau, sometimes poking you with a sharp stick called ruth. They may have turned this up, whether you had the Paula Jones case or not. But again maybe not, but again that's like if a frog had side pockets he'd probably wear a handgun. New Updates! (4/23/2019) We've been working really hard on completing our membership system so you can submit quotes and keep track of them. Once this is complete in the coming weeks there will be a lot more quotes by Dan Rather and other authors. We've also changed the sorting on the site so you now see the latest Dan Rather quotes first. 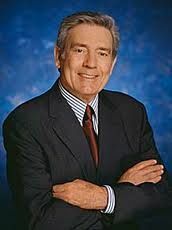 Our goal is to have the best Dan Rather quotes on the web!